As U.S. Secretary of State Condoleeza Rice and other international leaders gathered in Rome to discuss ways for the Israeli-Hezbollah war to end, Israeli and Arab reports disagreed on casualty figures for a fierce battle in Lebanon, and Israel expressed regret at the deaths of four United Nations observers. They were killed Tuesday when Israel dropped a bomb on a U.N. observation post on the southern border of Lebanon, provoking U.N. Secretary General Kofi Annan into saying he was shocked by the "apparently deliberate targeting by Israeli Defense Forces of a U.N. Observer post in southern Lebanon." Hours later, Israeli Prime Minister Ehud Olmert called Annan to express his "deep regret" for the deaths of the U.N. observers. Olmert said the peacekeepers were killed mistakenly and expressed dismay over Annan's accusation, according to a statement released by his office. The prime minister promised a thorough investigation and said the results would be presented to Annan. Israel's Ambassador to the U.N., Dan Gillerman, told Annan that "Israel remains committed to protecting the safety and security of U.N. personnel on the ground and is doing its utmost to guarantee that they be able to carry out their mission." "U.N. blue helmets are in the crossfire and the deaths are an indication of how difficult it will be to have an international military force on the border between Israel and Lebanon, whether it is a NATO force or a U.N. peacekeeping force," says CBS News foreign affairs analyst Pamela Falk. "It is not the first time that U.N. forces have been hit by Israeli fire, intentional or not." 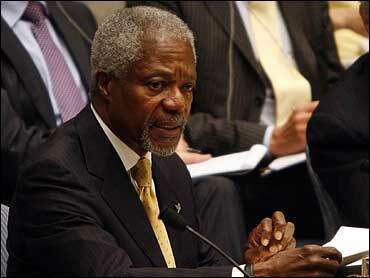 Annan commented while in Rome, where he and U.S. Secretary of State Condoleezza Rice and other international leaders are discussing proposals for ending the fighting that has already claimed more than 400 lives. Key issues include how to disarm Hezbollah and assemble an international peacekeeping force to enforce the peace along the Israel-Lebanon frontier. Israeli Defense Minister Amir Peretz said Tuesday Israel will maintain a security zone in the south until either a multinational force "with enforcement capability" is deployed on the border or Hezbollah is pushed back in a cease-fire agreement that also cuts off the supply of its weapons. Arab TV stations say 9 to 12 Israeli soldiers were killed and 25 were wounded in fierce fighting Wednesday as they battled Hezbollah to try to capture the Lebanese town of Bint Jbail. Israel Radio reports "at least ten Israeli soliders" were "hit" in a battle against some 200 Hezbollah guerrillas; it does not say how many were killed. The U.S. State Department expressed concern Tuesday about an unknown number of Americans stranded in south Lebanon without safe passage to evacuation points in the capital and on the coast. CBS News correspondent Lee Cowan reports that the U.S. State Department hopes to get an evacuation ship to Tyre to pick up stranded Americans Wednesday morning. There are between 30 and 40 Americans about 1.5 miles north of the Israeli border that the State Department is going to try to get to Tyre in time for the evacuation. The last scheduled boatload of U.S. citizens is expected to leave Beirut Wednesday afternoon, officials said. Some 15,000 Americans have been evacuated from Lebanon since fighting began. A Jordanian military plane landed at Beirut airport Wednesday to evacuate wounded Lebanese. The aircraft is the first to land since the airport was closed July 13 after Israeli airstrikes on its runways. Israeli commanders said Tuesday they would not push deep into Lebanon but were determined to stop Hezbollah missiles that have continued despite Israel's punishing raids on Hezbollah targets. A new volley of Hezbollah rockets hit northern Israel, killing a teenage girl, and Hezbollah's leader, Sheik Hassan Nasrallah, issued a taped television message saying guerrillas would now start firing rockets deeper into Israel. Germany's defense minister said a cease-fire must be in place before any international troops can be sent to Lebanon. Rice, in Israel on the second leg of a Middle East tour, maintained the Bush administration's position that a cease-fire must come with conditions that make an enduring peace. Israel is facing tougher than expected resistance as it makes it first small ground steps into hilltop villages across the border. Its troops sealed Bint Jbail on Tuesday and moved on the nearby village of Yaroun, fighting guerrillas there. Fifteen Americans fled Yaroun in a convoy of 80 cars carrying residents that reached the southern port of Tyre on Tuesday. Hezbollah reported two guerrillas killed in Tuesday's fighting, while Israel said three of its soldiers were wounded. The Israeli military said Hezbollah's commander for the central border sector, known as Abu Jafr, was killed. Israeli warplanes bombed Beirut on Tuesday for the first time in nearly two days after pausing during Rice's stopover in the Lebanese capital. A string of huge explosions raised a pall of smoke from Beirut's southern districts, and Israel said it was hitting 10 Hezbollah residences. Hezbollah says at least 27 of its fighters have been killed. Israel claims Hezbollah is greatly underreporting its casualties and says dozens have died. As the Israeli incursion continued Wednesday, a senior Hezbollah leader said the guerrillas had not expected such an onslaught when they snatched two Israeli soldiers July 12. "The truth is - let me say this clearly - we didn't even expect (this) response ... that (Israel) would exploit this operation for this big war against us," Mahmoud Komati, the deputy chief of the Hezbollah politburo, told The Associated Press. Hezbollah fighters battled Wednesday to stop Israeli forces from capturing a southern Lebanese town, leaving several Israeli soldiers dead, Arab TV stations reported. Al-Arabiya, a Dubai-based satellite TV channel, said 12 soldiers were killed as Israeli forces tried to gain control of the town. The Qatar-based satellite TV station Al-Jazeera reported that nine Israelis had been killed and 25 wounded. In Jerusalem, the Israeli military said no more than several soldiers were wounded in the heavy fighting at Bint Jbail, which lies 2½ miles north of the Israeli-Lebanese border. Israel Radio reported that "at least 10 Israeli soldiers had been hit" in heavy fighting against 200 Hezbollah guerrillas in the town. It did not specify how many Israelis were killed. A senior Hezbollah official, Mahmoud Komati, told The Associated Press Wednesday that Israeli forces had managed to seize a few points inside Bint Jbail, but had not yet taken the town center. The Israeli army said several Hezbollah fighters had taken cover in a local mosque. Hezbollah said "violent confrontations" were taking place between its fighters and Israeli forces attempting to advance toward a hospital in Bint Jbail, which holds the largest Shiite Muslim community in the border area. Hezbollah draws its support from the Shiites. Fighting has been heavy for days around the border towns of Aitaroun, Maroun al-Ras and Bint Jbail, where Israeli forces are trying to eliminate the guerrillas who have been firing rockets into Israel. The area controls the high ground in the central sector of the Lebanese-Israeli border. Bint Jbail is a symbolically important town for Hezbollah as it was a center of resistance to the Israeli occupation of southern Lebanon in 2000. Tuesday marked a month since the start of what is now a two-front war between Israel and Islamic militants. On June 25, an Israeli soldier was captured by Hamas militants in Gaza, prompting an Israeli offensive there. Two weeks into that flare-up, Hezbollah snatched the two other soldiers. Israel and the United States say the ultimate aim is to fundamentally reshape Lebanon to end Hezbollah's presence by the border, strengthen democracy in the country and ensure lasting peace with Israel. In the process, Lebanon has been ravaged, with hundreds killed, nearly a half-million driven from their homes and vast damage to roads and bridges. The three villages that Israeli ground troops have advanced on - Bint Jbail, Yaroun and Maroun al-Ras, which was seized by soldiers over the weekend - are in a roughly 3-square-mile pocket. Israeli bombardment has also destroyed most Hezbollah observer posts all along the border, U.N. observers say. Israel suggested that would grow - but the extent was unclear. Israeli army commanders said Israeli ground troops would not push deep into Lebanon, but instead aim to kill as many Hezbollah fighters as possible and push others away from the border. "We are very much dealing with the villages and towns close to the border," Brig. Gen. Ido Nehushtan said. "Our aim is not to occupy the territory." In one pre-dawn raid, Israeli warplanes destroyed two neighboring houses in Nabatiyeh, which is 16 miles north of Bint Jbail and has been heavily bombarded in the past few days. In one house, a man and his wife and their son were killed, said the couple's daughter, Shireen Hamza, who survived. Three men died in the other house, she said. While buried under the rubble for 15 minutes, "I just kept screaming, telling my parents to stay alive until help comes," she said. "My father kept saying to me in a weak voice, 'Shireen, stay awake. Don't sleep.'"